CULLMAN – The Cullman County Sheriff’s Office (CCSO) is requesting an increase in funding of approximately $1.5 million from the Cullman County Commission for FY 2019. The increase is needed, according to Sheriff Matt Gentry, because the CCSO has not received funding for additional deputies in four years, and that, coupled with the exponential increase in call volume and population growth, is straining the department. 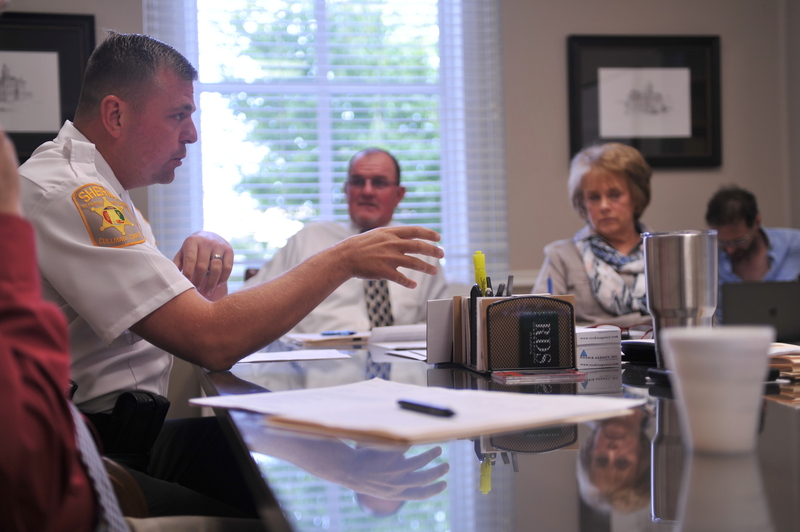 In a work session prior to Tuesday morning’s commission meeting, Gentry said the CCSO contributed $2,355,483 in funds to the commission directly and indirectly in FY 2018, through providing some of its own equipment, housing federal inmates in the Cullman County Detention Center, inmate labor and sub-station construction costs, among other items. “We are at max capacity with our employees as far as what we can handle and deal with and keep the community safe,” said Gentry, who said the CCSO has requested funding for more deputies for the last four years and not gotten it. “It’s to a point where we’re so short-handed where if one takes off, we’re having to fill that shift because of our call volume. We’re getting 54,000 calls for service this year, which is a 20,000 increase.” He said 60 percent of his department’s overtime is from staff shortages. Gentry said that when he came into office four years ago, the jail was housing 230-250 inmates a day. Now, he said, it’s 360-400 a day. He said at full capacity, there are only five deputies watching 400 inmates. Chief Deputy Brett Holmes, who accompanied Gentry to the work session, stressed that the reason the CCSO is so adamant this year about requesting the budget increase is liability. Right now, the CCSO is running eight deputies per shift. Commission members pledged to look for possible compromises that can be made in the budget to accommodate the requests. Also during the work session, the commission discussed the possibility of getting rid of cell phones used by some County employees. Some at the commission believe the cell phones provided by the County are unnecessary for certain jobs while others said the phones are useful. Commission members also discussed a person who has been living for free at one of the county parks in exchange for some work done for the park. The issue of whether or not to allow this was added to the agenda for the meeting, but the item was tabled to allow the issue to be further investigated by the commission. During the public comments portion of the meeting following the work session, a citizen spoke of problems with pot holes on County Road 1225, presenting a petition signed by more than 80 residents. The citizen asked the commission to seriously consider getting the road repaved. Resolution 2018-32 was approved. The resolution adopts the procurement procedures of the Federal Transit Administration for the Cullman Area Rural Transportation Service. The new procedures increase the procurement amounts from $3,500 to $10,000 for micro purchases and $100,000 to $250,00 for simplified acquisitions. The commission approved an abatement for North Alabama Fabricating Company (NAFCO) in the amount of $4 million, for new production equipment and building modification. This was an expansion of the existing abatement. A public hearing was set by the commission for Sept. 25 at 10 a.m. The purpose of the hearing is to discuss the FY 18 Community Development Block Grant program and the proposed applications the commission plans to submit to the Alabama Department of Economic and Community Affairs for funding consideration. This date gives the commission time to post notice of the hearing and make citizens aware so they can voice their concerns. In a "good faith" commitment, the commission approved a 10-year abatement for "Project Purple," for a $5,734,750 capital investment. The project is expected to create about 50 jobs with an average hourly wage of $21.44, according to Cullman Economic Development Agency Existing Industry Coordinator Luke Satterfield. Details of the project are expected to be released soon. Resolution 2018-34 was approved, renewing a contract though the Association of County Commissions of Alabama (ACCA) for workers compensation through Sept. 30, 2021. The commission also authorized the annual premium payment for the same contract through Oct. 2018 to Oct. 2019 in the amount of $517,900.37. The commission also authorized the payment of dues for ACCA for the upcoming fiscal year at the cost of $8,407. The commission authorized Walker and Cullman County Emergency Management Agency Director Phyllis Little to sign the Emergency Management Performance Grant in the amount of $42,572. Walker and Little were also authorized by the commission to sign the EMPG supplemental funding for $12,000. Little was also authorized to sign a memorandum of understanding between the North Central Alabama Regional Council of Governments and the Cullman County EMA for Disaster and Emergency Management Services. The agreement provides services for the elderly and disabled in the county in the event of a disaster at no extra burden to the EMA office. Walker was authorized by the commission to sign a long-term detention contract with the Alabama Department of Youth Services for FY 19. The contract was for two beds at Tennessee Valley Detention Center for next year. The commission voted to approve guidelines for debris and waste removal from the rights-of-way. The motion passed although Commissioner Garry Marchman voted no. Marchman said he needed more time to look over the guidelines, since he said they were just added to the agenda the hour before in the work session. A 2007 Dodge Dakota pickup truck, from the reappraisal department, was approved for surplus on GovDeals.com. –Bid No. 1268- An extension to an existing bid, for service of the various department vehicles by Santex doing business as Havoline Xpress Lube. FY 19 budget work sessions will take place on Sept. 17,18 and 20 at 8:30 a.m. in the commission conference room. The next commission meeting will be Tuesday, Sept. 25 at 10 a.m. in the commission meeting room.